Posted on October 13, 2015 at 10:32 am. For months we’ve all been holding our breaths as the Mega Moolah progressive jackpot has continued to soar to dizzying new heights and on October 7th 2015 that mega jackpot was finally won, making one lucky player £13,213,838.68 richer – that’s over a whopping AUD $27.5 million. 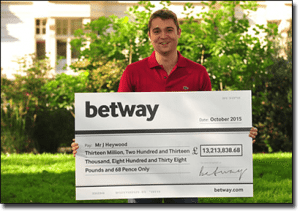 The winning spin was placed at Betway Casino by a 26 year old soldier from the UK, Jonathon Heywood, who placed a 25c spin on Mega Moolah and watched in awe as he became an instant millionaire. “It’s all so surreal, and I can’t come to terms with it just yet,” Jonathan said after his win, “I just kept staring at my screen and seeing this huge number in my Betway account”. There couldn’t have been a more deserving winner, having recently returned from a tour of Afghanistan, grieved the loss of his grandfather and watched his father suffer from illness over the past year. Jonathon plans to use his winnings to get the best care money can buy for his father as he waits patiently for a lung and heart transplant. In true down-to-earth style, the first thing Jonathan did when he won the jackpot wasn’t throw a crazy party or make a grand purchase; the first thing he did was go to work. He does have some extravagant plans under his belt though, telling reporters that after paying for his father’s treatment he will treat himself to some new wheels – a classic yellow Bentley Continental GT to replace his modest Fiat Punto. Alan Alger, spokesman for Betway Casino was thrilled that the winning spin was placed at their site, saying, “We are delighted for Jonathon and having met him the day after his win we can honestly say that it couldn’t happen to a nicer young man. We hope he really enjoys the world record win”. Jonathon’s win has set a new record for Mega Moolah, a game which has affectionately been nicknamed ‘The Millionaire Maker’, beating the previous record of US $9.49 million which was won by another UK player, John Orchard back in 2012. This Microgaming progressive jackpot pokies game has become one of the most popular online pokies due to its ability to produce some truly life-changing wins. The team at OnlinePokieGame.com has been watching for months as the jackpot has climbed by the millions as more players flocked to Microgaming progressive network casinos to get in on the action. Mega Moolah has re-set to its base jackpot of $1 million and will no doubt grow rapidly as more players flock to online casinos inspired by Jonathon’s success story. 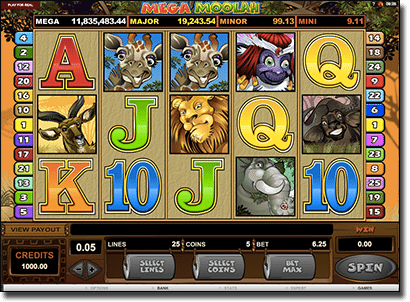 You can play Mega Moolah on desktop, laptop, smartphone or tablet at our recommended Microgaming casinos like www.RoyalVegasCasino.com.